NZSM Associate Professor Samantha Owens tells the story of a German band held as prisoners of war on Matiu/Somes Island for almost 5 years. In the leadup to the centenary of Armistice Day on November 11, which New Zealanders will be marking with a "roaring chorus of jubliant sound" (see ww100.govt.nz/roaring-chorus), spare a thought for a group of professional musicians who spent November 11, 1918, interned on Matiu/Somes Island as prisoners of war. Groups of itinerant German musicians had been coming to New Zealand regularly from the 1850s onwards, so it's not surprising one such group happened to be in the country when the war started. Despite playing "Rule Britannia and other English national airs very violently" on Auckland streets, within days of New Zealanders receiving news of the outbreak of war on August 5, 1914, Rudolf Mersy and his Bavarian Band had been arrested, transported to Wellington by train and shipped across to Matiu/Somes, in the middle of the harbour. The 12 members of Rudolf Mersy's band ranged in age from 18 – Willi Hinkelmann – to 47 – Mersy and Friedrich Weingarth, and while four of the men were single, the remaining eight left behind their wives and a total of 25 children back in Germany. Mersy, known as the "Aschbacher Mozart" after his home town, had visited Wellington on multiple occasions, as part of several extended tours to New Zealand during the early 1900s. His multitalented instrumentalists played both wind and string instruments as required by the occasion, whether busking, playing at school sports days and community picnics, or providing entertainment in private homes. In 1902, for example, when Kate Joseph hosted an "At Home" at her residence in Hobson St, Thorndon, Mersy's band, "stationed in the conservatory, played up-to-date and pretty music during the afternoon". The "green-coated band" that was "established in a corner of the tennis-court" in Katherine Mansfield's The Garden Party was surely also one such German band. The conditions during the Bavarian Band's nearly five-year island internment were cramped, but Mersy and his band continued to make music for their fellow prisoners. Their instruments were sent down to them by Auckland police, although, regrettably, Ludwig Oemcke's silver-plated cornet failed to arrive. 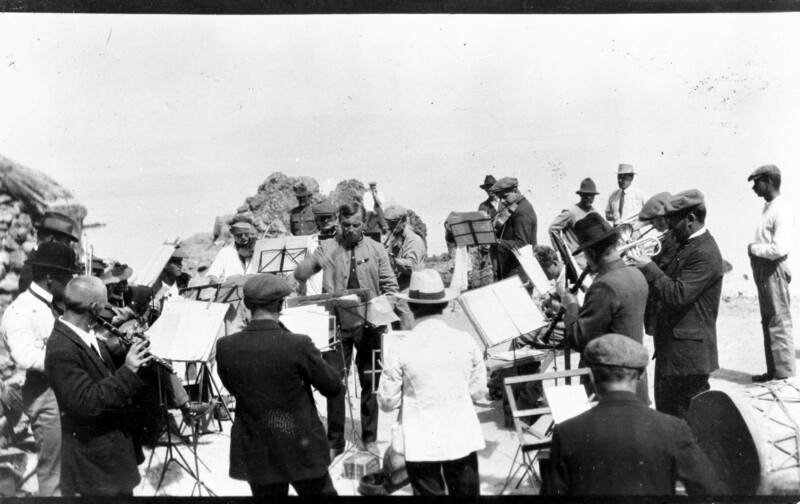 A photograph that survives as part of the Roger Hart Collection in the Alexander Turnbull Library shows the musicians performing on the island, with Mersy conducting. By late 1917, the number of prisoners on Matiu/Somes had reached 277. While poor accommodation, lack of food and sometimes brutal treatment led to some of the band members being escorted to Wellington Hospital for treatment, there was undoubtedly kindness shown to them by Wellingtonians. The New Zealand Times reported that Mayoress Jacobina Luke – great-grandmother of Wellington city councillor Nicola Young – went so far as to visit the island. "Having heard that some of the men detained there were in need of clothing, she went to see for herself what could be done." She later received a CBE for her war work. 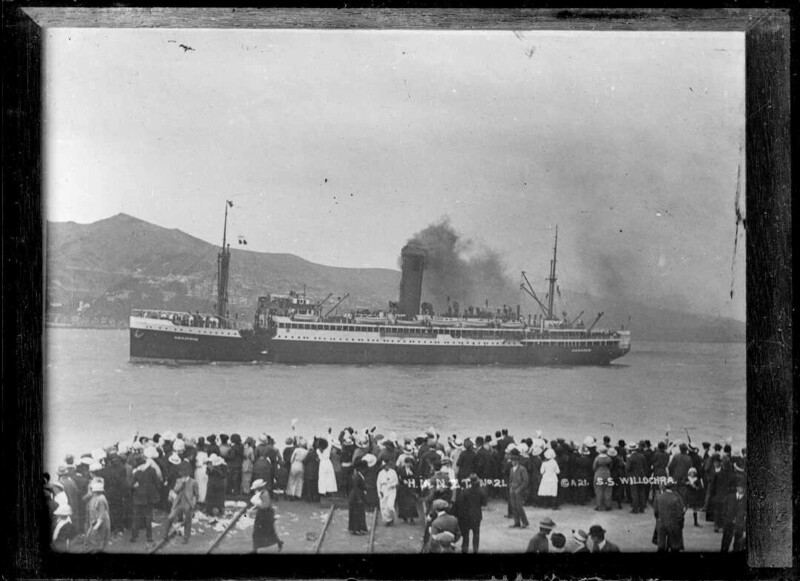 A crowd farewells soldiers on the troopship HMNZT 21 (SS Willochra), as it leaves Wellington during World War I. In May 1919, Mersy and his fellow musicians were among 410 prisoners of war and their families who were forcibly repatriated from New Zealand to war-torn Europe on the steamship Willochra. On board, the band frequently entertained their fellow prisoners and also played nightly for the officers' mess. When leaving the ship in Rotterdam, Mersy presented Major G. R. Blackett (a Nelson man in charge of the prisoners) with the Willochra Waltz, a piece that he had composed on the voyage, but which is now sadly lost. The important role played by German musicians in the development of musical life in New Zealand before World War I is not often acknowledged. Despite leaving little trace today, Mersy and the Bavarian Band deserve not to be forgotten. Such German bands added greatly to the colour of daily life in New Zealand and allowed people from all classes of society to experience both classical and popular music. I hope that on November 11, 1918, the members of Mersy's Bavarian Band were also allowed to contribute to the "songs and cheers, miscellaneous pipings and blastings, and tootings and rattlings" that greeted news of the Armistice across the country, even as prisoners of war in the middle of Wellington Harbour. Associate Professor Samantha Owens is a musicologist at the New Zealand School of Music – Te Kōkī at Victoria University of Wellington.